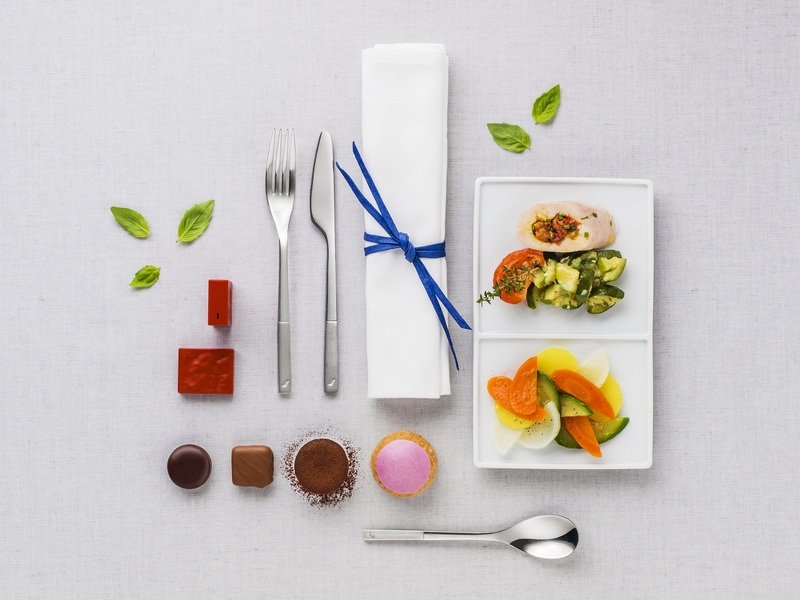 In the Business cabin, meal service is a treat. Sit back and enjoy an elegant and refined culinary experience. At breakfast, enjoy a selection of delicious pastries served hot. At lunch and dinner, you receive a full meal composed of an appetizer, main course and dessert. On longer flights,* we offer a welcome beverage, a selection of hot meals, digestive liqueurs and coffee with a pastry. In addition, cocktails (with or without alcohol) are available on request on all flights. On flights departing from Europe, information pertaining to food allergens contained in meals is indicated on board by the cabin crew. In the Business cabin, your culinary voyage begins with a welcome drink. You can then discover our wine list, crafted by Paolo Basso, named the world’s top sommelier in 2013. Our wines are served during meals and at any time you would like another glass. French designer Jean-Marie Massaud crafted an elegant table set to make your meal a unique dining experience. He also designed sleek and elegant glasses in transparent materials that evoke a spirit of airiness and flight. We have chosen luxurious items in fine materials, including porcelain by Guy Dugrenne and steel flatware by Christofle, to make your table an exceptional setting for your meal.